Multibagger hidden gems stocks can make you a billionaire in a short period of time. However, it is very difficult to identify hidden gems multibagger stocks on Dalal Street as it demands a lot of hard work and research. You need to consider multiple factors such as earning potential, a line of business, debt level etc. 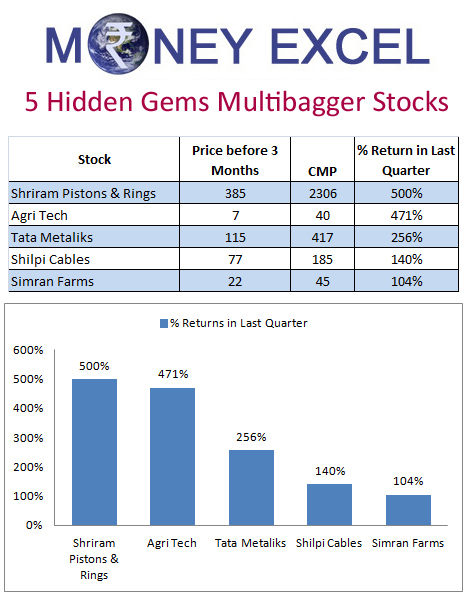 I have identified 5 hidden gems multibagger stocks that have generated returns up to 500% in last quarter. Shriram Pistons & Ring is identified first hidden gem multibagger stock in the list. Shriram Piston & Rings was listed on NSE on 9th June, 2016. In a short span of two months, this stock has generated 500% return for the investors. Shriram Pistons is the biggest manufacture of Pistons, Pins, Piston Rings and Engine Valves. This stock has touched upper circuit limit 42 times in past two months. Strong fundamentals and outperformance industry average on almost all parameters are main reasons for the exceptional growth in this stock. You can purchase this stock for the long-term perspective. Agri-Tech is second hidden gem multibagger stock that has generated magnificent 471% returns for the investors in the last quarter. Agri-Tech (India) is in the manufacturing business of the fertilizers. In a short span, this stock has generated magnificent returns for the investors. A growing demand of agriculture industry due to very good monsoon season is a prime reason for the rise in stock price of Agri-Tech (India). Tata Metaliks is another multibagger hidden gem stock. Tata Metaliks has generated 256% returns for the investors in the last quarter. Tata Metaliks is leading manufacturer and supplier of iron. It is Tata group of company. Last quarter result of Tata Metaliks was very good. The company reported a three-fold jump in standalone net profit at Rs 22.42 crore for the quarter ended June 30. The stock has upside potential of 12-15% from the current levels. Shilpi Cables deals in manufacturing and supply of varieties of cables used in telecom, automotive and power sector. The stock of shilpi cables has generated 140% returns in last one quarter. The company is aiming to be billion dollar company by 2020. Shilpi cable is fundamentally strong stock and expected to be good multibagger stock of future. Simran Farms is last hidden gem multibagger stock in the list. Simran Farms has generated 104% return for the investors in last quarter. Simran Farms is in the business of poultry farming and related poultry business. This stock is in high demand and it is surprising to note that only buyers are found in a trading session of this stock. This could be very good multibagger stock in future you can plan to invest in this stock. What is your call about this identified hidden gems multibaggers stocks.